This category is for general photography blogs. Like those commercials that ask “What’s in your wallet?” I’m asked what equipment I pack when I travel. The answer would definitely be, “It depends.” Depends on where I’m going, how I’m travelling, why I’m travelling, who’s going with me and what I want to photograph. Let’s see how these parameters play out. There are few times when I don’t carry the DSLR with me. But only when I need to travel very light or I will be in meetings the entire trip. On almost every other trip I have my Canon with me. When I don’t have the big gun, I do have my iPhone and usually my iPad. So then the answer is, “I don’t travel without my camera.” Whenever feasible I do take the DSLR with me. Control is important from lenses to exposure. I have a selection of lenses from 24mm to 200mm with a 2x convertor taking me to 400mm. Then there are the specialty lenses: a 100 mm macro and a Lensbaby kit. The selection of lens(es) is really a question of weight and bulk. If I am travelling light then I usually stick with the 24-105mm lens and body. This is the lens that came with my DSLR, but unlike many kit lenses it is a great piece of glass. The Canon EF 24-105mm 1:4 L IS USM lens is very sharp. It offers wide angle (at 24mm) to a moderate telephoto (at 105mm) range. When I am travelling with weight restrictions then this is the lens that comes along. When weight is not a factor, then I’ll add the EF 70-200mm 1:2.8 L IS II USM lens. This is one of the world’s finest telephoto lens. With the Canon 2x convertor its range extends from 70-400mm. That is about as far as I’m interested in extending. I don’t do a lot of birds and small wildlife so I’m simply not into lugging really long lenses. The telephoto is an essential lens. When I pull my lens usage statistics I find that the 70-200mm is used for about 35% of my photographs. That is higher than I would have first expected. But upon reflection I’m not surprised. It was a beast to master but a delight to use. If I’m not worried about the weight then the 100mm macro and Lensbaby kit come with me as well. If I am expecting to do closeup work then the macro goes for sure. The reason that this lens is number 3 in selection is that both my 24-105 and 70-200 lenses cover the 100mm range. It is only needed for close up and macro work. Sometimes if you have a travelling companion they will be willing to carry some of the accessories with them that you do not want to check in luggage. The second or third person certainly can help the weight issue. A few years ago I remember being up near the airport in Sedona, AZ waiting for the sun to start illuminating the sky and the amazing red rocks that surround Sedona. I was shaking in the sub-freezing wind. But I knew that my photographs would be fine with my tripod supporting the camera rig. Now I had the 70-200 and the 2x convertor on the tripod. So there would be no hand-holding this rig in the faint early morning light. Another would-be sunrise photographer showed up a little before dawn. He looked at me and said he wished he could have had a tripod too. But he had flown in from back east. I gently explained that I had flown in as well, but my packing choice had been to bring the tripod and leave some clothes at home. This is my usual choice. The tripod goes before more shirts. My current tripod is a beautiful carbon-fibre model from Really Right Stuff. You’ve heard it said when you buy the best you only have to buy it once. Well the tripod is a good example. Find a sturdy set of legs that you’re willing to carry and buy them as early in your photo career as you can. You will not be disappointed. If my DSLR is coming then my tripod will be right with me. All of my lenses have circular polarizers on them at all times. If I don’t need it then I’ll take it off that lens while photographing. I also carry three Lee Filter graduated filters and the Lee Big Stopper. These all attach to the camerawith a Cokin ProZ holder. The Cokin is an all right holder, but I will no doubt upgrade it for a Lee system soon. There are four Compact Flash cards attached to my camera strap. I carry 24 GIGs of cards with me. These have always been sufficient to handle my needs. A few times I’ve downloaded photographs at lunch time to my backup hard drives, but that is rare for me. The cards hold over 700 RAW images when all are full. If I will need to download files I carry my laptop, card reader and cables. Gloves and toque or hat for cold mornings. Hand warmer pack for really cold mornings. Multi-axis bubble level that fits the camera’s hot shoe. Flashlight for early morning and late night shoots where you need to see the camera settings. Spare camera battery and charger. Filter boxes to hold the circular polarizers if they need to come off and spare UV filters. X-rite Colorchecker Passport for colour balancing scenes. Wimberley Plamp goes from the tripod to hold a blossom steady in the breeze. This is essential equipment if you are doing macro work. Wimberley Plamp. 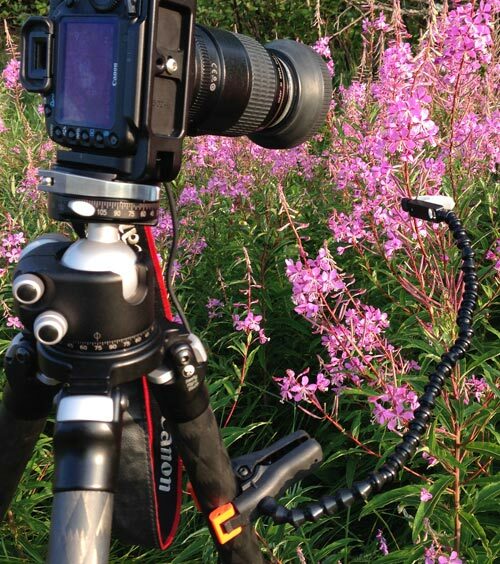 This is a versatile clamping arm that is indispensable when doing macro photography. It clamps onto the tripod and holds the subject still in the breeze. The plant end is a very gentle clamp with the ability to attach with velcro or a pipe cleaner to hold the plant or subject without damage. You can see it in action in the photo to the right. Panorama bar from Really Right Stuff for creating panoramas. I have created a no parallax position chart for both my 24-105 and 70-200 lenses for panoramas. Backpack style camera bag is my bag of choice. Sometimes if I know I will want to just carry my DSLR for part of the trip I will pack a smaller carrying bag in my luggage to use on those days. This is usually stuffed with socks and such in my suitcase so it takes up almost no room and it has little weight. Lens cleaning cloths, air blower and sensor magnifying glass to clean the camera. Business cards for when someone you meet on the trail wants to contact you later. A very small fold up stool for those low to the ground shots. Now you won’t need everything I take with me. And I’m sure you will have other things that you couldn’t think of travelling without. That’s fine. I seldom take everything. Pack what you think you need and what you are willing to carry. Travel by automobile certainly gives you more options, but flying gives you more destinations. Ah, photography: always a balancing act. We’ve all heard the story about the young axeman who thought he could fell more trees than the old lumberjack. So he challenged the old man to a head-to-head competition. Throughout the day the old man would always cut down more trees per hour than the youngster. The harder the young man worked, the more trees the old codger would cut. The challenger would work non-stop and yet the old man would best him. What was worse that even though the young man would work without a stop, the seasoned veteran would take regular breaks! Finally the challenger decided to see what the old man was doing on these breaks. He had to be cheating somehow. At the next break he followed the old man back to the camp. What he saw amazed him. Rather than kicking back and relaxing the old axeman went right to the grinding wheel and spent his time sharpening his axe. When the veteran returned to cutting trees he did so with a knowledge that his axe was the best it could be for the task at hand. We all know who won: the old lumberjack with the sharp axe. 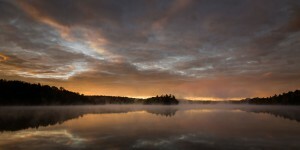 Fog Over Gin Lake a limited edition photograph on canvas. Photography is like that too. Not that old men always win, but that the person with the sharpened skills and vision will create superior images. We have all seen an inexperienced photographer create a stunning image. And you say, doesn’t that disprove the point? No, it does not. For as with the lumberjacks if the competition had been to fell one tree the young man may have won. But the competition was over time. And over time the person with the skills and vision will turn out superior results. Yesterday I spent significant time setting up and calibrating a panorama rail. Not exciting photography. But now when I set out to shoot panoramas I know that my camera and lens will be the best it can be for the job. Sharpening the axe can mean spending time reading your manual or going online to learn a new technique. If you want to learn about calibrating a panorama rail go click here and see how the people at Really Right Stuff do it. Now I can’t wait to create some amazing panoramas in the field. I wish you a good week and urge you to spend a few minutes sharpening your photographic axe. The water flows from Burleigh Falls and cascades over the rocks forming these rooster tails of spray. This is an wonderful work for over a sofa or bed. I know it’s over ours. This summer I had the privilege of being one of the premier exhibitors at the Buckhorn Captured in the Camera photography exhibit and sale on August 23. As part of the daylong exhibit the organizers planned to have three “Lunch and Learn” sessions for attendees. These sessions were to present a particular facet of photography to those who would like to attend. When the curator found out that I had taught photography for twenty years at the University of Windsor I was asked to present all three sessions. One of the sessions was titled: “Water: Capturing the Emotion.” If you have seen my art show exhibit you will know that many of my images include water in one way or another. Why do I photograph water? There are many reasons. I like the fluid flow of water in motion. There is an ever-changing pattern of the water. As a photographer I plan the photograph, composing the frame, choose the shutter speed and aperture, applying whatever filters I deem necessary. That gives me the basic shape and composition. But then the forces of nature take over the process. I have to work with what God provides to extract the image as the scene moves me. Making a Splash, 20″ x 32″ Limited Edition Giclée Canvas $365 The waves frolic on the rocks as sunset approaches on Australia’s Philip Island. They are like children wanting to get a last splash before dark. The motion, volume and speed of the water all interact with the time of exposure to give different results. Sure I have a good idea of what the image will look like, but the flow at the precise time of exposure is what is recorded. With water you have a choice in the final look of the image. Using a faster shutter speed freezes the motion. (It doesn’t freeze the water.) That allows individual drops of water to show. 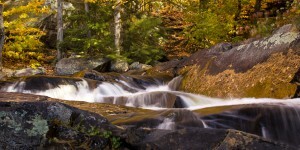 Fast speeds in the neighbourhood of 1/500 of a second will stop most water motion. That gives you an image like “Making a Splash” with the water in midair. 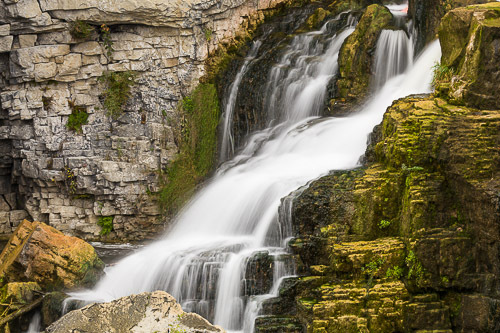 Stubb’s Falls 20” x 40″ Limited Edition Giclée Canvas $450 Stubb’s Falls is one of the hundreds of water falls in Ontario. It is a charming venue north of Huntsville, Ontario. I especially like the detail of the water arching over the rocks. To record the flow of the water in “Stubb’s Falls” I used a much slower exposure. This allows the water to flow into the silken patterns over the rocks. It also allows for individual drops to “streak” in arcs above the main water flow. This is always an added bonus of water photography. The old adage, “Success doesn’t just happen. It’s planned for.” certainly holds true with photographing water. The process is trying to make the water look wet while you stay dry. 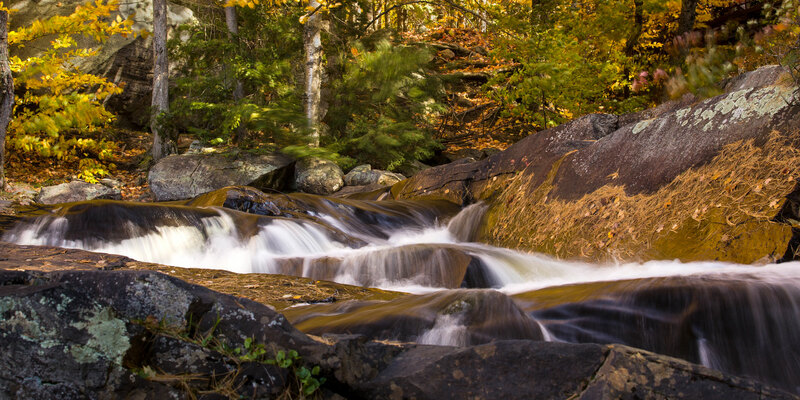 For those who would like to try their hand to create flowing water photography you need to have a camera that can slow the shutter to at least a quarter second or more. If your camera has a manual setting then you are half way home. The second tool you need is a sturdy tripod. Then experiment with different shutter exposures. I find that exposures in the half to one second range is a good starting point. If you would like to purchase any of the images used in this blog then email me or call at 519.563.7118. Ocean Mist, 20” x 40” Gallery-wrap canvas Giclée limited edition print, $450. My second day on the Great Ocean Road in Australia started with promise. I was heading to the 12 Apostles rock formation. As a pilot, I was looking forward to renting a helicopter and doing some aerial photography along this stunning stretch of coastline. But at the airport the choppers were coming and going into a definite haze layer that looked like it was not burning off in the morning sun. I went into the airport office and they confirmed my suspicion. The haze was expected to last all that day and probably for a few more days to come. Aerials were out and the best way to photograph would be to stay out of the haze. So I hiked off along the ocean-side trail searching for interesting images. If my previous days’ adventures in Australia were any indication I felt my efforts would be rewarded. I soon found a beautiful location and set up my camera. I liked my composition with a number of the rocks in the ocean just off shore. The hazy sky gave a soft glow to the scene. 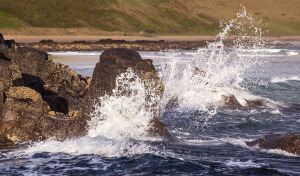 The ocean was relatively calm but had a few waves flinging themselves upon the outcrops. Nice, but I felt that the ocean had more to offer. One of my favourite camera filters is my Lee Filter neutral density filter: the Big Stopper. Its claim to fame is that it blocks 99.9% of the light from passing. When you first look at it you think it’s a piece of black glass. 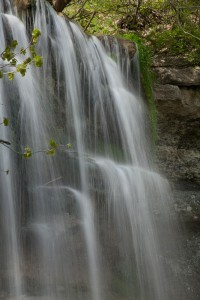 It is that, but the density makes for some very long shutter speeds. The effects are amazing. Whatever is stationery is rendered sharp, but whatever is in motion blurs or “averages” the exposure. For “Ocean Mist” the exposure was 75 seconds in daylight. 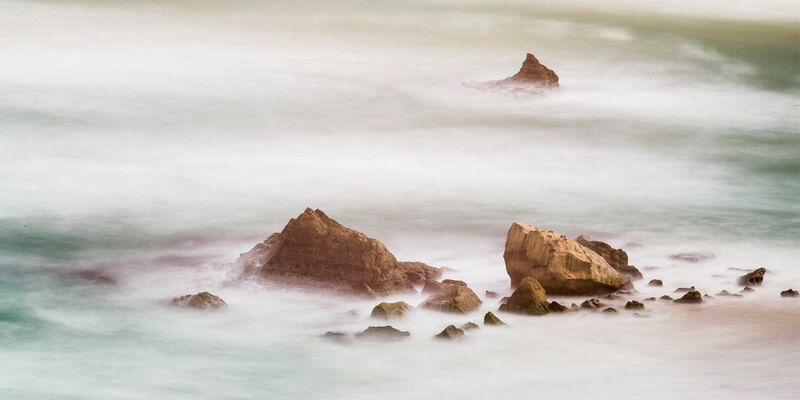 Here you can see the ocean waves dancing about the rocks and forming a magical mist. The hazy overcast added to the soft effect. My lens was set at 400 mm to fill the frame with the scene. Success. Ocean Mist captured the feeling of being there. This image is one of my favourite Australian images. I am sure it will be yours, too. If you are traveling to Australia I would highly recommend the Great Ocean Road southwest of Melbourne. It is considered one of the outstanding drives in the world. Remember if you are driving the Aussies drive on the left (and you should too). That means that driving the road from east to west will keep you on the ocean side and you won’t have to keep crossing traffic as you pull back on the road from the many stops you will want to make. To purchase one of the remaining prints of Ocean Mist click here and send me an email or call me at 519.563.7118. Usually when I blog I sit and write post-event. Whatever the subject is about it has already happened and I am commenting on the event or product or image. Today I decided as I was about to sit and write that I would reverse the process and photograph for the blog. Last night I picked up a dozen roses with baby’s breath for my wife while we were shopping. Yeah, I know, the ladies think I’m wonderful and the gentlemen think I’m spoiling life for them. My wife comes from a family that farmed flowers, so she loves to have them–especially with the brutal winter we’ve had this year. But I digress. I find that photographing flowers in winter can be a frustrating activity. There seems to be a great deal of damage to the blossoms. Sure you can spend time in Photoshop to retouch the images, but that’s not why you want to photograph in the first place. I try to photograph flowers which have bloomed from a bud while we have had them in the house. I find there is much less damage to flowers in a closed system. Baby’s Breath from a bouquet of roses. The fun of photographing in the condo rather than in my office is that I am photographing with the barest of equipment: camera, tripod, cable release. The light is daylight from the wall of windows streaming into the kitchen. Just simple photography. 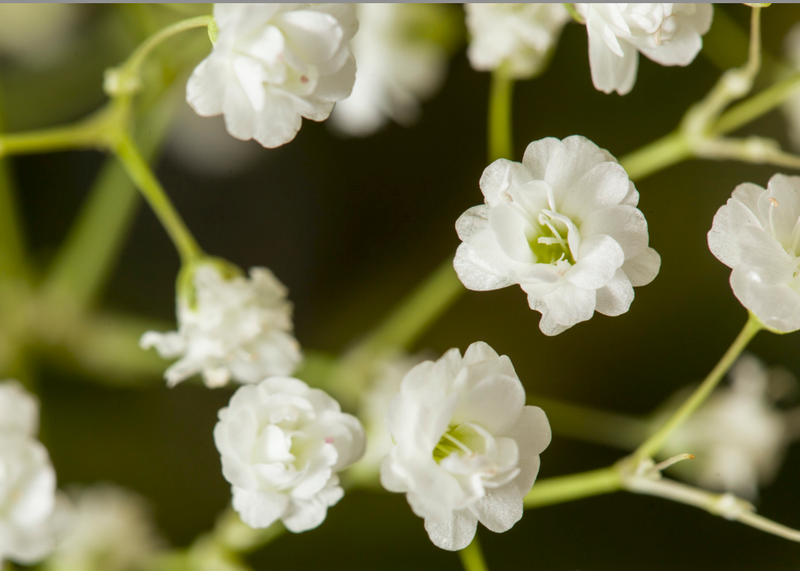 While the roses didn’t impress me with their various markings, the baby’s breath were delightful. I switched from the roses to the little white flowers that offer the accent to the bouquet. I started to play with changing the background, reflectors to bounce light back into the shadows and the flowers glowed. We should always be open when we photograph. Sometimes the original subject just doesn’t work. That’s fine. Unless you are doing a commercial shoot where the client is paying for shots of “the roses” then let serendipity be your guide. Have fun photographing whatever your final subject. Next time I may buy just the baby’s breath. Naw, that’s not such a good idea. I may as well get the brownie points for the roses, but I could move directly to photographing the little white flowers. Always look at your opportunities. Ok, I admit it. I do read the manual. There it’s out in the open for all to see. But then why wouldn’t someone read about the features that they have just laid out a lot of money to buy. That never made sense to me. Sure it was alright I suppose many years ago in the film days when cameras and equipment were non-electronic. You had a shutter, aperture ring, focus ring, depth of field and mirror lock up buttons. Each button had a function and they were simple to figure out what they did. 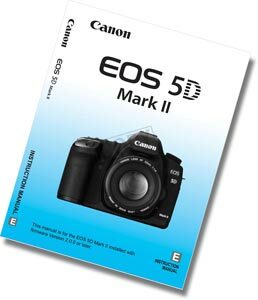 Canon 5D Mark II manual. Today we are in a different time. Once electronics took over photography there are more settings and buttons and button sequences than you can keep track of without a manual. My camera has custom function settings. There are 70 different settings available. In the manual the custom function settings start on page 193. That is a lot of information before even getting to the settings section. So why wouldn’t you read the manual? Well, one reason is that the manuals are often really hard to read. The are obviously written by a technician who is throughly entrenched in the company jargon-speak. The language and thought process is difficult to follow. In many instances the translation becomes really stilted. I never understood why companies that spend so much in producing a product falter at the last step in the communication chain. If you are a manufacturer reading this let me suggest that you spend a few dollars and have writers in the different languages rewrite your manuals to make them flow. One alternative which I use from time to time is to buy a third party book about the equipment in question. This has two advantages: it is usually written by someone who speaks your language and it is often written by a photographer who knows his or her audience and what they are trying to do with the product in real life. When I buy a new camera (or other piece of equipment) I usually follow this process. I read the manual starting carefully at the beginning and then picking up speed. Those features that I know I’ll never use I still skim over just to know what it will do. Unless I will be using a feature very soon I don’t bother reading the detailed step-by-step instructions. I’ll never remember the steps so why bother to take the time reading. When I need to use the feature then is the time to go back and go through it slowly. When I’m done I will often revisit the important parts and read it again in more detail. Sometimes I will purchase a third party book about the device even before I buy the hardware. This allows me to be ready to use the equipment as soon as it’s in my hand. At other times when the manual is particularly bad I buy the book to replace the manual. When I’m selling a used piece of equipment I always include any books about it as a value added feature. This clears my book shelf for more materials. Finally I make sure I carry all the manuals with me in the field. I carry not only my camera manual but the manual for all my lenses and other gear as well. No need being five hundred miles away and not knowing how to activate a feature. I don’t carry the paper manuals because they would weigh almost as much as the photo gear. What I do is to download the manufacturer’s manuals onto my iPad. All the manuals are kept in one collection in iBooks ready to read wherever I’m at. If you have ever tried to figure out a setting on your flash in the field you will find this an invaluable tool. To summarize: read your manual and have at least a passing familiarity with the features on your equipment. Take the manuals with you electronically. Don’t be afraid to buy the how to use books available for your equipment since they will often teach you how to improve your photography as well. There are some people who really like to be outdoors in the Winter. My brother would rather ski over Christmas than go to Florida for instance. Me? Not so much. Winter scenes are fine and sometimes fun to photograph. But winter can be a low point for photography shooting. It’s just too cold out there. Set up an area indoors for closeup and macro work. Make it an area you can leave and come back to when you have time. I have mine set up with a simple lighting assembly. You could use window light if you prefer. Then pick up items in the house you like to photograph. I enjoy closeups of flowers. I drag different flowers from around the house into my office every few days. Then when I have time I do a little shooting. 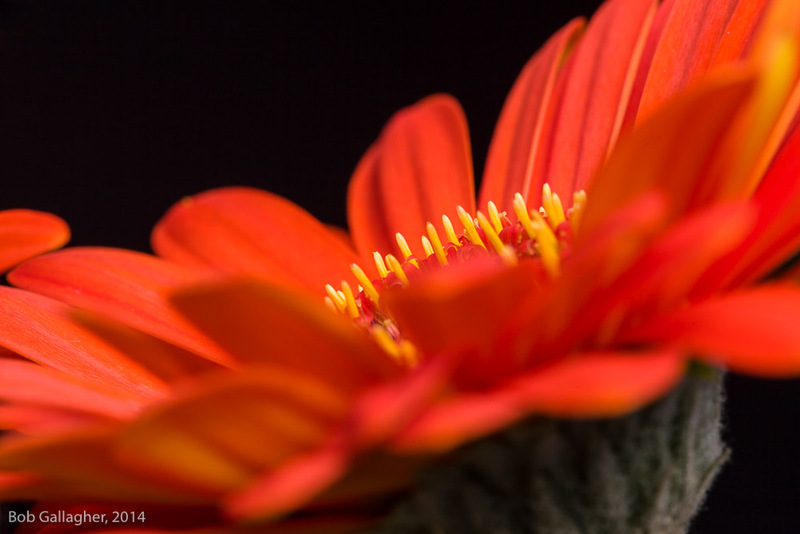 A note to those who would like to photograph flowers. You are going to be photographing very close. Be very critical of any blemishes on the flowers. They will be VERY evident on your photograph. When you buy a flower from the store they often are not picture perfect. They have what pilots describe on airplanes as “hanger rash.” Those little marks that no one knows where they came from but the mark is there. To avoid these hanger rashes buy a plant with buds. When the flower emerges from the bud it is often pristine. A great way to get beautiful flowers and to teach you some patience. In any case, I do enjoy photographing wider in motion. Yesterday I delivered a dozen canvas mounted photographs to Marten Art Gallery in Bayfield for a one man show entitled H2Oh! and yes, they were primarily images of water. Judy Stephenson, the gallery curator, had suggested the show should have a central theme. I was proud of the images I had selected. It will be a good opening show for her 2013 tourist season. 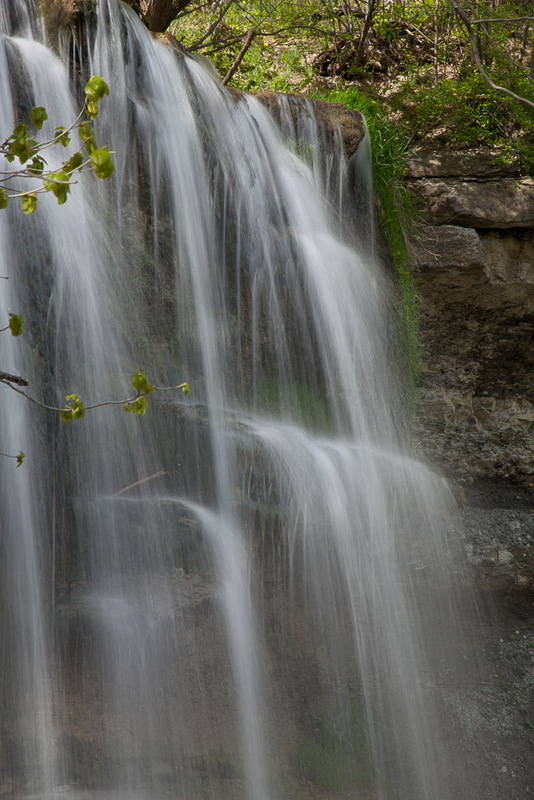 Waterfalls at Rock Glen, ON, Canada. On the drive back I stopped in the town of Arkona, Ontario to check out the Rack Glen Conservation Area that my close friend Mark Clemens had shown me some years earlier. Rock Glen Falls is a lovely small waterfalls. While the lightning was acceptable, I felt it would have been better coming from a different direction. Those of you who know me will attest there is a moderate amount of geek in my bones. I do like technology and the benefits it can deliver. Now, as Paul Harvey would say, here is the rest of the story. The Photographer’s Ephemeris on my iPad showing the sunrise, sunset, moonrise and moonset for Tuesday, May 14, 2013. You can set any date. If you will be outside of cell coverage then be sure to do a screen save at home. I’d like to go back to Rock Glen to photograph. But what would be the best time of day to get there? 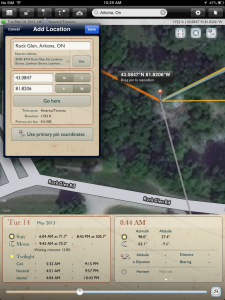 For that I turn to my iPad app The Photographer’s Ephemeris. You can see why they call it TPE. This amazing app combines satellite imagery similar to Google Maps with the movement of the sun and the moon. All I had to do was to type in Arkona, ON and TPE zoomed into the town. I dragged over to the North East and found the Conservation Area zooming in on the Falls. By sliding my finger over the timeline I can see where the sun rose and set. By saving the location (see the screen capture) I will be able to predict precisely where the sun will be at any given time on any date I may return. This is a phenomenal tool for photographers. If you want to see where the sun or moon will rise or set anywhere in the world I strongly urge you to download this app. It’s $10 well spent.